The Francis Marion University Theatre will close its 2018-2019 season with Bert Royal’s Dog Sees God: Confessions of a Teenage Blockhead. “Good grief! The Peanuts kids have finally come out of their shells.” —Time Out NY. “A welcome antidote to the notion that the Peanuts gang provides merely a slice of American cuteness.” —NY Times. “…easily identifiable with the Peanuts crowd yet with a distinctly ‘Royal’ touch…The way Royal builds on the foundation of Charles Schulz’s iconic comic strip actually results in a parody that’s also a stand-alone play apt to resonate even with anyone belonging to that small population segment unfamiliar with Peanuts.” —CurtainUp. “Inventive and raunchy…hysterically funny.” —NY Post. 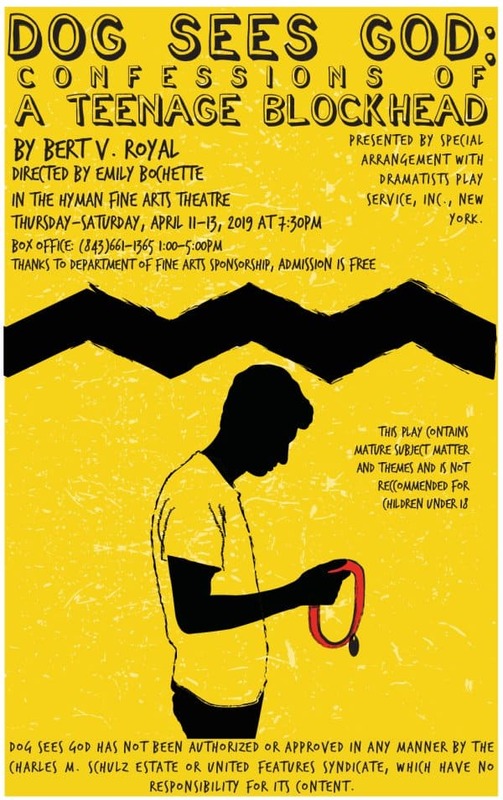 “Bert V. Royal is the playwright of the Off-Broadway show DOG SEES GOD: CONFESSIONS OF A TEENAGE BLOCKHEAD and is he ready to confess all!” —Broadway.com. “DOG SEES GOD doesn’t feel like the same old high-school-warfare schlock. The characters—teenage and reckless—are both genuinely sympathetic and unquestionably cruel. Growing more hysterical—and more harrowing—as it flows to an inevitable, uncomfortable end, this taut comedy manages to make tired clichés about stoners and popular homecoming airheads funny and endearing.” —NY Magazine.